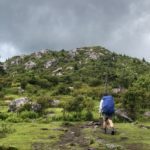 I recently completed a weekend backpacking trip in the southwestern corner of Virginia in the Mount Rogers National Recreation Area. Many know to it and refer to it as Grayson Highlands. 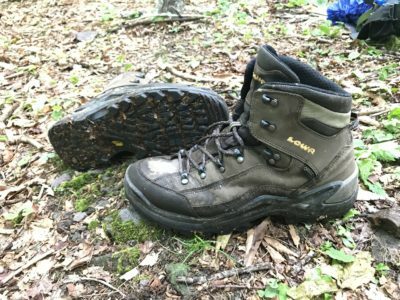 23 miles and two nights on the trail gave me the perfect opportunity to put the Lowa Renegade GTX Mid hiking boots to the test. I’ve heard a lot about the Lowa Renegades from others, and one thing that really stood out to me was that they need little to no breaking in. I’ve worn the boots around the house, but nothing strenuous and not for a long amount of time. I made the perhaps poor choice of deciding not to put any miles in the boots before this trip. I was very nervous about this decision, as I usually have to put a good number of miles and stretch into shoes to break them in. The first night, we drove a long 4.5 hours to the trailhead in the southwestern tip of Virgina. It felt good to get out of the car and hit the trail even though it was a late start. I made the decision to try a few different types of socks with the boots and started the first 8 mile segment that evening with a thin pair of synthetic performance socks. 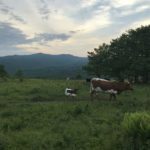 This first segment of the hike was on the Virginia Highlands Horse Trail. The trail wasn’t too strenuous or technical, but it did have a couple of miles of gravel and small loose rocks that really challenged my feet to get solid footing each and every step. After 8 miles and setting up camp in the dark, I remembered my boots. I understand, strange thing to say when I am supposed to be testing a pair of boots, however, this is a testament to how comfortable and protective the Renegades are. My philosophy with all shoes is that if a pair are doing what they are supposed to be doing (protection, comfort, functionality)I shouldn’t even have to think about them. I didn’t even think about the boots those 8 miles…they were that good. Boots the morning after our first 8 miles in. Our second day consisted of 13 miles on a portion of the Appalachian Trail. The east coast, and especially this portion of the Appalachian Mountains had received close to 2 feet of rain in the previous weeks. The trail was soggy, but not muddy for the first hour or so of the hike. Then the storms rolled in. For the better part of 10 miles on day 2, we dealt with heavy rain from scattered storms. Not once did my feet get wet. 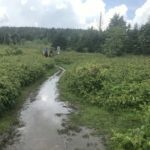 I had no issues with traction, both in the mud as well as on the slick, rain soaked rocks that made up a good portion of this part of the AT. I always felt like I had good, secure footing and that I could trust my next step. Often times, there are portions of trails that I hike on with rocky sections where there is no good step to take without wedging my toe between two rocks. The Renegades were up to this task and were rigid and thick enough in the toe box, that I didn’t have to worry about jamming a toe or hurting my feet. I had on a good pair of thick wool socks for this second section of the trip which kept my feet comfortable and much to my delight and surprise, I had no blisters or hot spots when we rolled into our campsite that evening. One of the rocky crags on this section of the AT. On our final morning, as my two friends complained about how soggy the interior of their boots were, I just smiled and I slipped into my dry boots with a fresh pair of socks. Our final day was a short, 2 mile, downhill hike back to the car. We made quick time and were back at the car in no time. My ankle stayed locked to the heel of the boot and I didn’t experience any of toe bash that can often happen on quick descents. As I peeled off my boots and slipped into my sandals when we got back to the car, I marveled (and told my two friends who were with me) at just how good these boots were. 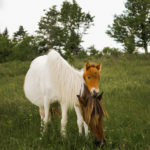 Wild ponies along the AT. Comfort and protection: After not breaking in the shoes, they performed amazingly well! Kept my feet dry, comfortable, and safe. I couldn’t ask for more. Functionality: Not once did I feel like I had any issues with traction on any parts of the trail (mud, wet rock, etc). A full day of rain and waterlogged trails and my feet were never soggy. These are a great pair of boots! I can’t wait to hit the trail in them soon and forget that I am even wearing them. Check back in about a month to see my final update. Founded in 1923, Lowa has been making shoes for nearly 100 years. “Lowa footwear is 100% designed, sourced, and manufactured in Europe. 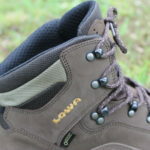 “Lowa is the only outdoor footwear manufacturer in the world to be granted ISO 9001 certification. Check out this video by Lowa on how the Renegade GTX is handcrafted. 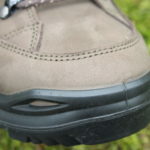 Comfort and protection: are my feet comfortable and safe from the elements and terrain? Durability: does the shoe stand up to the demands placed on it? Functionality: does the shoe actually perform as designed? 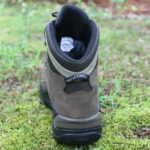 The Lowa Renegade GTX Mid is a mid-height boot designed to be comfortable enough for day hikes and rugged enough for backpacking trips under the weight of a loaded pack. 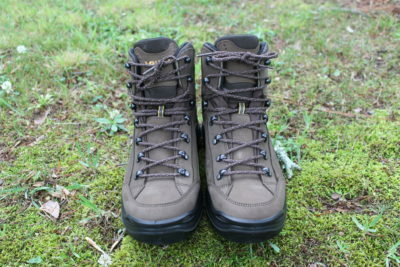 The boots in the colorway that I recieved (Sepia/Sepia) present what I think, is a classic hiking boot look. They aren’t flashy by any means, but they have a clean, no-nonsense appearance that I hope speaks well to their performance and quality. While my feet aren’t wide, I am flat footed which means that narrower shoes can cause me severe discomfort. 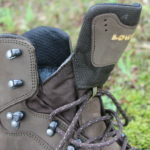 This means that finding hiking boots with a good fit can be difficult, and often leads to much longer break in periods for me as I stretch the shoe out. I initially opted to get a Wide last with the Renegade GTX Mid to help accommodate my flat-footedness. They ended up being a bit too wide; to the point where my foot could move laterally, even when I had laced down the boots as tightly as possible with thick socks on. Because of this, I switched to the regular last and the fit was much better. I was impressed with the initial fit walking around in the boot. My initial impression is that the boot will offer ample and snug support around the ankle. The footbed is also comfortable, more so than I would have thought on first putting it on with a leather hiking boot. Unlike with the wide last, the normal last didn’t allow my foot too much lateral movement. The boots lace traditionally, with three sets of open hooks at the top of the lacing system. Lowa refers to this as a “locking ankle hook” This system should allow me to adjust my boots to achieve the ankle support in the collar I need. Gore-Tex seems to be the gold standard when it comes to weather-proofing outdoor gear. 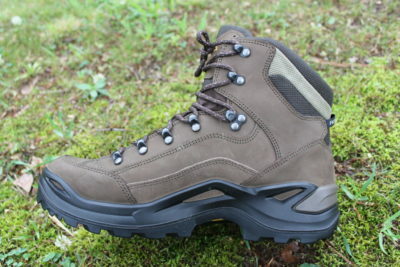 The Renegade GTX Mid boasts a Gore-Tex lining which should keep my feet dry when the elements aren’t. 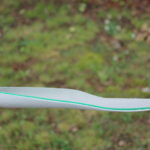 One caveat to weatherproofing technologies: heat retention. I will make sure to note during my testing how the boots breathe (or if they don’t). As mentioned earlier in the post, one of my main three concerns in reference to this boot is comfort and protection. The Nubuck leather upper should allow the boot to remain soft and pliable as the boot is exposed to the elements. 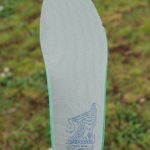 As noted in the specs the PU Midsole and MONOWRAP support frame could keep my feet comfortable and protected. 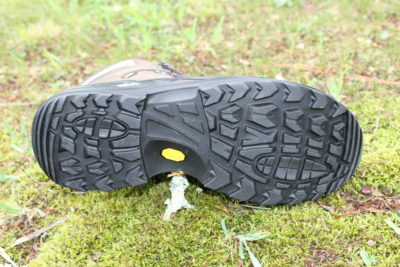 I am also curious to see how the Vibram EVO sole performs. As far as durability goes, I will make sure to note in my further reviews how the boot hods up. I am especially interested in seeing how the outsole/midsole seams stay bonded to the leather upper. I am excited to put the Lowa Renegades to the test! Check back in about a month for my initial review. 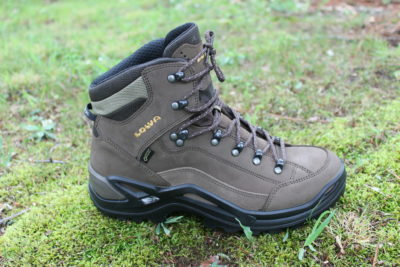 Thanks to Lowa and 4AllOutdoors for the opportunity to test these boots!